Some things in life, that you have always wanted and wished for, would just find its way and reach you - My way of explaining the Law of Attraction. One of the online fashion Accessories company had approached me a few weeks back, asking if I would review their product. Initially I was very interested , but later on I found out that there was a big catch as I had to pay for the shipping & delivery charges, which amounted to a huge sum of money ( upwards of USD 50 ). Though I did not have any issues for paying and I finally decided to refuse to do it thinking that the product was not really worth that money I was going to pay for the shipping and weight. I was just roaming around in a mall recently on the eve of Christmas, when I saw this huge board saying upto 70 % off in one of my favorite jewelry shops here in Singapore - Lovisa. You can read more about what I have previously bought from Lovisa here. I found a very similar neck piece that "The Company " had offered me at about just 1/3 rd of the Shipping charges that I had to pay. The original price was about SGD 59 and I got it for SGD 20 and I felt it was totally worth it. There was no looking back and I wanted to grab it immediately along with 2 other earrings which also had great discounts. 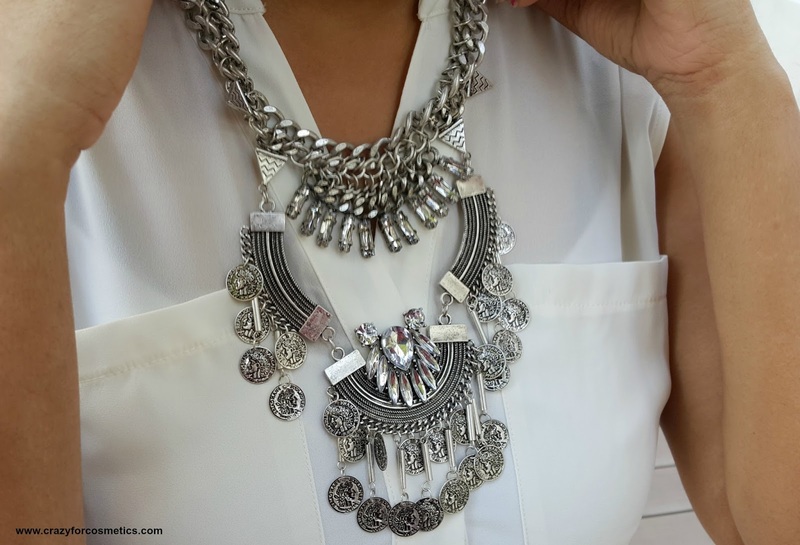 So when such a beautiful necklace is in your collection, how long can you wait to style it and flaunt it. There is this beautiful lane in Singapore called Haji Lane , which is rated as one of the best spots for photo shoots. Haji lane is situated in the Arab quarter of the city containing the age old buildings which have been modified to house quirky, quaint coffee shops as well as boutique shops. I dressed up well, grabbed the camera and my husband and headed there last weekend.So enough of talking and let us get to the Outfit, "The Statement Necklace " and the styling details. Haji lane was supposed to be really colorful with wall murals and interesting buildings and hence I decided to dress in light colors and I chose white so that it would look great against the colorful background. Year end is always fun because work kind of takes a back seat and it is time for relaxing, partying and enjoying with family and friends. 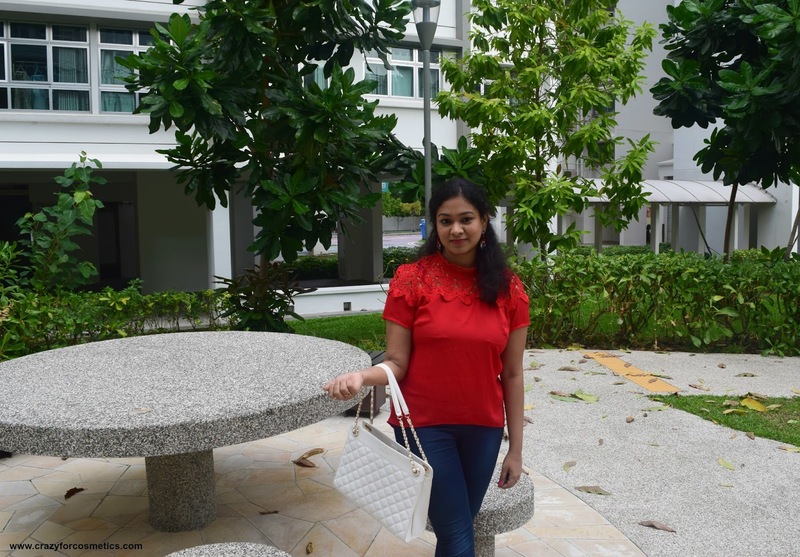 Of course, both my husband and me neither have many friends nor go for any parties, but we do like to spend time by going for a dinner or exploring new places here in Singapore. This year, we are away from our families which is kind of different for us but this is reality and we have to handle it. We headed out to The Gardens by the Bay on Christmas, in order to explore the place and enjoy their light show. I have earlier been to the Gardens with my friends and you can read about it here. We reached the Gardens at around 5 pm ,so that we could have a relaxed evening by the river side and click good pictures of the light show. We explored The Cloud Forest Dome and then went on to see the light show at 8 45 pm. More details of the Gardens by the Bay would be given in a separate post. Now moving on the outfit I wore , I chose a simple plain red top with a blue jeggings. I added some bling with my accessories and went in for a beautiful red stone earring that I got recently from a sale. It was not until lately that I started developing dark circles due to erratic sleep patterns and hence I decided to buy a good concealer which can cover up my dark circles on those days when my face demands it. A Small Note : Citibank credit cards are just amazing when it comes to their reward points and I have had a great experience with it back in India as well. Here too we are using Citibank Credit Card and I got a MAC 50 SGD voucher recently from my points. Isn't that awesome ? No, this is not a paid post but this is out and out my happy experience with Citi Credit Cards. So with the 50 SGD voucher burning a hole in my pocket, I was really eager to go and buy myself some MAC products. 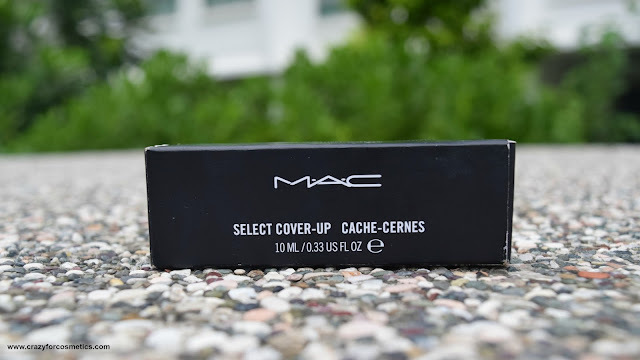 I went to the MAC store in Bugis Junction, Singapore and got this awesome MAC Select Cover -up Concealer in the shade NW 35. My friend Krupa from ishtyleawhile had been to Singapore few weeks back and we decided for a girls day out, with one of her cousins too joining us. We girls have done a couple of Youtube Videos too which will come up soon on both our channels. So we girls decided to head out to some colorful places around in Singapore and click good pictures of ourselves and have a good time together. 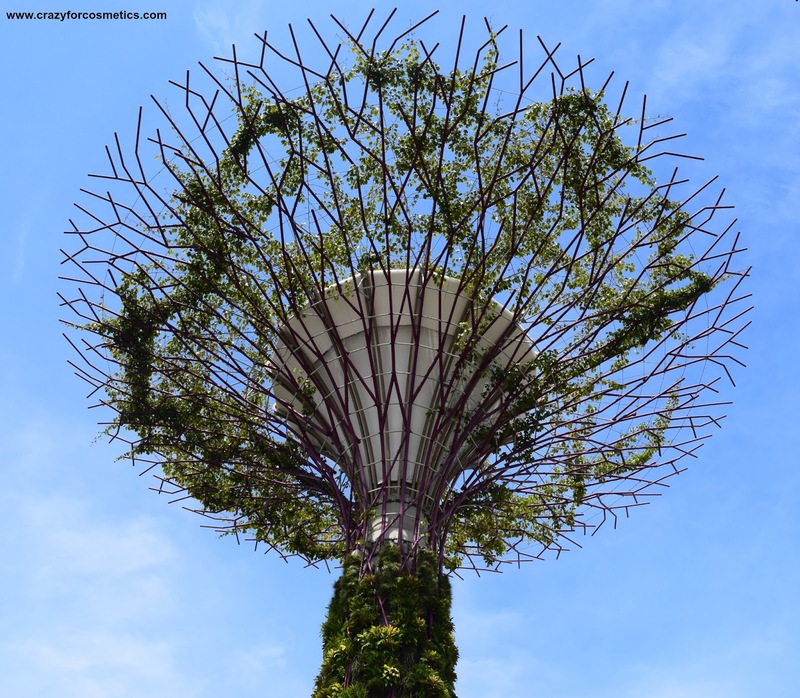 The first thing we decided to do was to head to Gardens by the Bay and explore the place. This was my first time there too and it was just beautiful. The only problem on that day was that, it was too hot & humid and all my makeup had melted away by the time we girls met up. Located along a waterfront, the gardens house several domes with various types of flowers & plants from different parts of the world. There are a lot of shows to watch and restaurants to eat too while catching up on the shows.The Singapore flyer and the Marina Bay Sands hotel are the neighboring attractions and we had some breathtaking views of all of them. 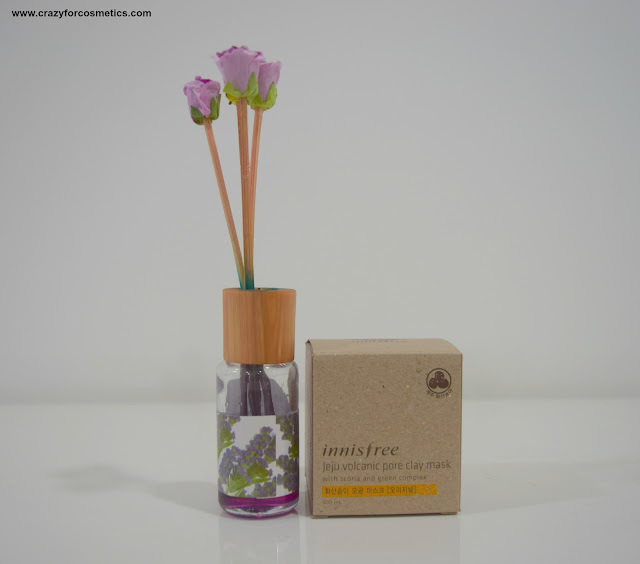 Spending some quality time at a Spa might cost you lots and so here I have a simple DIY Spa Night Video so that you too can be inspired and relax at the convenience of your home. I spend some time to take good care of my skin whenever I find time and I just recorded once such routine for you.You must not ignore your skin because it would start showing signs of aging at a faster rate than expected. I have always wanted to flaunt thick luscious looking hair which I am not blessed with. So here I have my dream come true moment with Irresistible Me Hair extensions. So I have the review of the website irresistibleme.com and their hair extensions for you. Exchanges and Returns are free for US customers. International customers will have to cover for the shipping fees of their exchange or return. 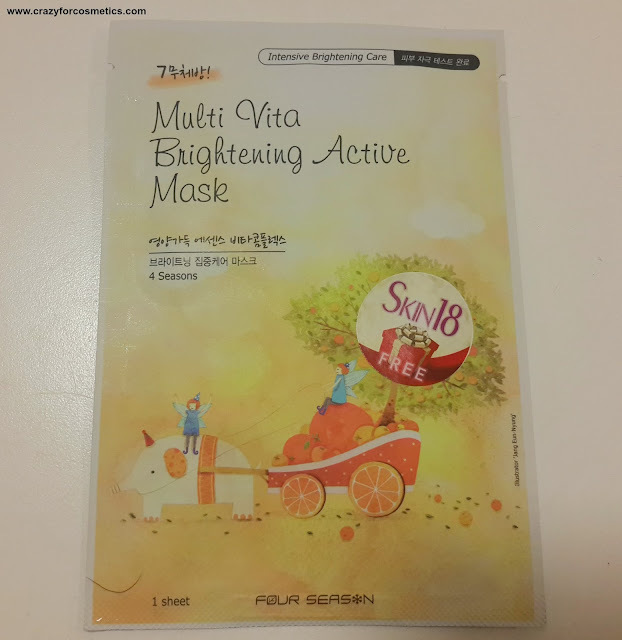 All products are exchangeable or returnable, with the exception of the products from the HIGHLIGHTS line and HAIR CARE line: please note that the HIGHLIGHTS products are NOT exchangeable or returnable. All sales for those products are final. Please note that all products that are in the "Sale" section are not exchangeable or returnable. All sales for those products are final. Visuals of My Chennai drowning in water was so haunting. When I kept talking to everyone about it, people were ridiculing me that I am just talking & not taking any action. No one knew I was gathering all information from my facebook posts and passing it on to my friend back in Chennai who had lot of Volunteer friends. Something that I could do sitting here 2900 km away from home was just this. We had earlier booked tickets to a Vijay TV show in Singapore , which was scheduled on Nov 27th but had got postponed to Dec 11 th , due to the Chennai rains. The Channel suddenly announced that the funds collected would go towards rehabilitation of Chennai and I was so happy so that I could contribute something to the relief work. The show that we attended was a program that had all the reality show artists performing live and it was worth every single penny we paid. 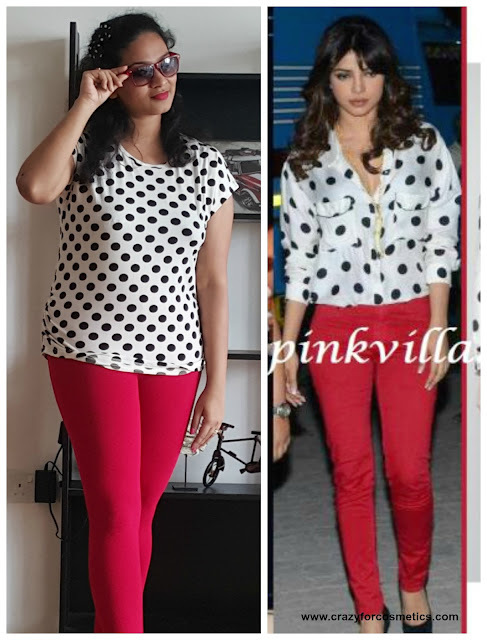 I wanted to wear something unusual and decided to dress up in one of my recent purchases from Jabong.com. I have always wanted something different & loved the Dhoti style pants or Kurtis. Interestingly I found this Kurti by the brand called AKS on Jabong and ordered it. This is the first ever time I am ordering a dress online and I was quite apprehensive about the size. I chose XL and to my surprise I found it to be just perfect for me. 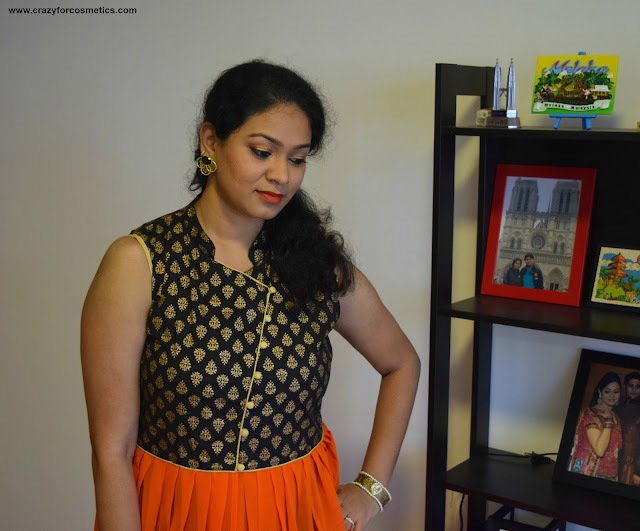 I am in love with the Kurti and I wore a black legging to match it. I kept the accessories simple with elegant earrings & bracelet from Confusions FA. I have been used to only hot summers predominantly in Chennai & Singapore is quite similar except that I sweat even more here. Experiencing just one weather throughout the year has its own advantages such as eliminating the need for buying different set of clothing for every season & disadvantages such as not being able to experiment with different colors & textures of clothing. The compilation of outfits that I have for you are not the ones I wear in Singapore because I would end up sweating like a pig & I always prefer light airy cotton clothes.Nevertheless, in today's article , I am going to be giving you some ideas for a hot, sunny , bright island vacation.These are the outfits I sported during my Bali trip and you can see how I have paired the accessories for each one of them. Skirts are again back now with more varied and fun , floral prints. 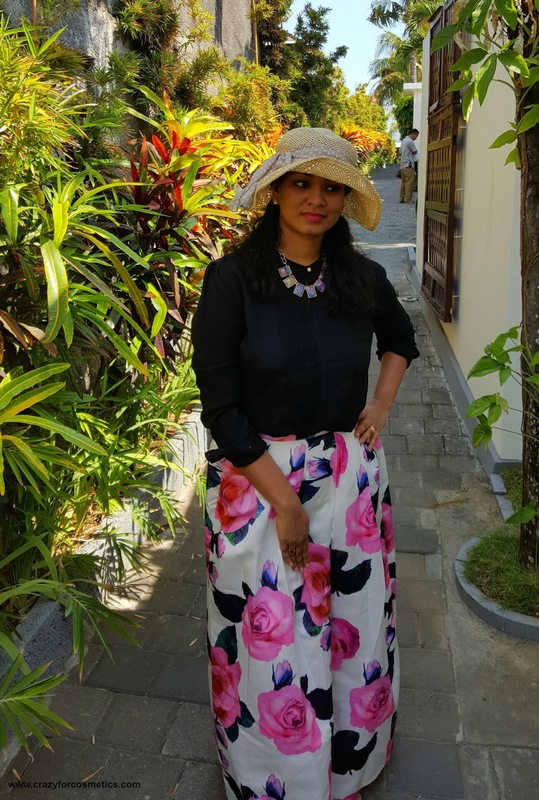 I love floral prints and Bali was one such place, that I did not want to miss flaunting my floral skirt.